While the Japanese beetle season is slowing down for the year as the grubs seek shelter deep down in the soil, the spreading threat is still in the back of horticulturists minds. Japanese beetles, first found in the U.S. in New Jersey in 1916, have managed to spread through the majority of the states east of the Mississippi River. Partial infestations have begun in some states west of the Mississippi River. 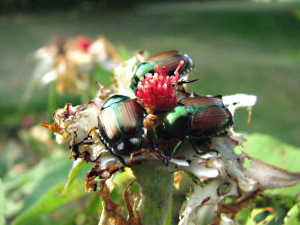 In lieu of the growing threat of Japanese beetle’s devastation on plants, many states west of the Mississippi river have been instructed to follow the regulations of AHPIS’s (Animal and Plant Health Inspection Service) Japanese beetle quarantine. The regulations are being enforced in Arizona, California, Colorado, Idaho, Montana, Nevada, Oregon, Utah, and Washington. They were designed to reduce the spread of Japanese beetles by aircraft. Montana in particular, has had numerous issues with keeping Japanese beetles from spreading into the state. After a significant increase in the beetles (accidently) brought into the state through regulated nursery stock, the department had to re-instate the exterior Japanese beetle quarantine in 2013. The Montana Department of Agriculture now regularly inspects nursery stocks and diligently conducts inspections to prevent additional quarantines. To prevent the potential spread of Japanese beetles, nursery owners can refuse shipments in violation. Amongst others, Montana continues to take measures necessary to prevent the continuing expansion of the Japanese beetles.